Share with others - great for gift lists! Light & sound flip up X-Rays. Light & sound patient bed. Includes play IV, tools & toy patient. One of the must-buy toys on children’s wish list according to Walmart’s Hottest 25 Toys list for 2016 is the Doc McStuffins Hospital Care Cart. Kids love the idea of helping their stuffed animals get well again when they’re sick. It’s a toy that’s educational as well as a kid favourite, thanks to the loved Doc McStuffins character. The cart is a lot of fun, with bright eye-catching colours – perfect to engage young children as they play. 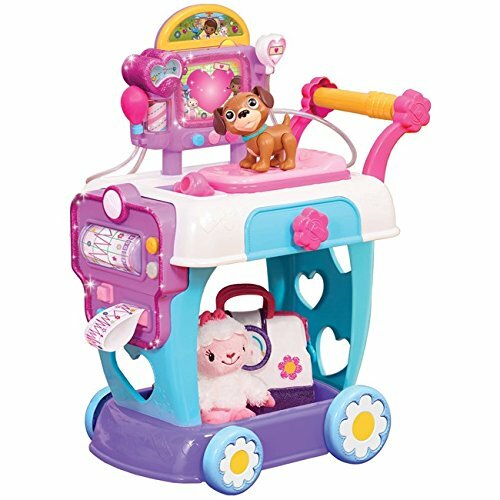 The cart has little wheels, with flower stickers, which roll smoothly over different surfaces, as your child makes her rounds from room to room on her rounds to see the toy patients. The cart is packed full of pretend doctor’s instruments to take care of any of their injured or sick toys. Children love the thought of being able to copy Doc from the show that airs on Disney Junior. They can line up the toys and have their patients waiting to be seen. During treatment time, kids can put the toys in the middle of the cart – much like a table at the doctor’s office – to find out what’s wrong with them. Whether the toy is sick, or just in for a checkup, the cart contains everything your child will need to help out. The cart has a light that allows kids to check out their toys, as well as a scanner. Kids will love using the X-ray to see what’s wrong with their patients. The X-ray comes with cards that show the different characters from the Disney Junior show. When checking out the patient’s heart, the cart can enable kids to see the patient’s heart patterns. The heart rhythm tool is on a roller at the front of the cart for easy access. There’s a blood pressure pump that so kids can check out how their patient is doing. A familiar tune that kids hear on the show can play, as well as interactive parts that can make sounds like a real doctor’s office. The cart keeps all of the medical tools neatly in the drawer, so when kids need to rush off to treat the next patient, all they have to do is load it up and off they go. The hospital care cart comes with one toy so kids can get started right away treating him. Findo is the little dog that needs tender loving care to go make him well again. The cart not only encourages kids to use their imaginations, but teaches them to be kind and caring. The suggested age range for this toy is 3 years old and older. 3 AA batteries are included when you buy. If there is a downside, it may be that there is not enough to keep your child entertained for a long time, especially as they grow older. But if you are looking for a toy for a toddler who really likes Doc McStuffins, you may feel that this is justifiable and that you are prepared to replace it with the next thing after a year or two. The Doc McStuffins Hospital Care Cart is a great addition to any fan’s toy room. Your child will learn to take care of their toys and make sure they are healthy, not sick. The fact that Doc McStuffins teaches this nurturing in children is a great life lesson, and one that may be particularly useful if you have younger children too. Star Wars: Kylo Ren From Funko Pop! Copyright © 2019 ferret's toy store.